It was a nervous year, with the world-wide economic crisis always lurking. But we did not see any overt signs among the line-up of exhibitions for the year. These were strangely self-referential, with lots of over-due retrospectives or major museum shows for Japanese artists who have always seemed to be “young and up-and-coming”. Examples include Teppei Kaneuji (reviewed by Kenneth Masaki Shima) and Tabaimo at Yokohama Museum of Art, Roji Ikeda at (the newly renovated) MOT (reviewed by Cameron McKean), Tomoko Konoike at Opera City (reviewed by Rebecca Milner), Kohei Nawa (reviewed by Sophie Knight) and, currently, Motohiko Odani, both at Maison Hermes. 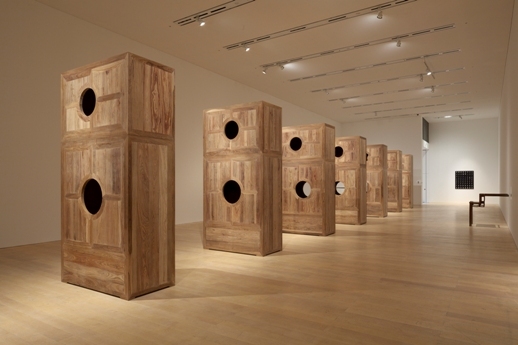 Commercial museums like Mori held many blockbuster shows, including Ai WeiWei (reviewed by TABuzz). “Bones” (reviewed by Matthew Hayles) was a stunning design show at 21_21 Design Sight, supervised by Shunji Yamanaka. Hara also continued producing ambitious exhibitions, with a major Jim Lambie installation (reviewed by Jessica Niles DeHoff) at the start of the year and a wide-reaching show looking at so-called Micropop art in Japan (reviewed by Mark Downing Roberts). This was also the year that zines and print media made a big comeback in Tokyo. Zine’s Mate was a major book fair (we did a photo-report on it) and later in the year there was the magazine event, “Tokyo Graphic Conference” (reviewed by Sophie Knight and Rebecca Milner). Also making a big return were art collective Chim↑Pom, who bounced back from their Hiroshima controversy to launch a book and several shows this year (see Sophie Knight’s review of the NADiff exhibition and this photo-report of the Yamamoto Gendai opening). In a city with limited space and lots of people, public art events are always sure to find an audience, often just by crowds and commuters stumbling upon it on their way somewhere. The “Roppongi Art Night” (reviewed by Kenneth Masaki Shima) was, mercifully, free from commercial cynism despite its locale — but it also wasn’t exactly good either. The “Natural House” workshop held in plush Ebisu was a more striking and sincere example, igniting urban residents with the hope of sustainability. We interviewed the founders, a British gardener and a Japanese architect. Lastly, the current “No Man’s Land” is a bravado, unique experiment featuring over three hundred artists transforming the soon-to-be-demolished French Embassy in Hiroo. 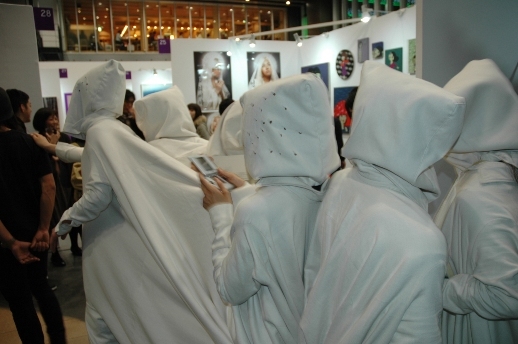 “Art Fair Tokyo” had growing numbers of booths and attendants, apparent proof of recession-defiance. Did it add up to interesting art in the end? No word yet on whether “101Tokyo” will happen next year but it did take place concurrently with “Art Fair Tokyo”, at a different style of venue to its debut one. 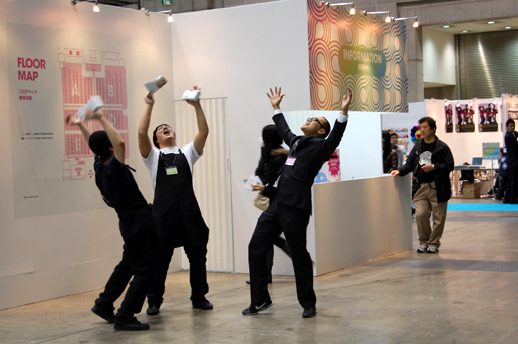 We did a photo-report on it, along with the autumn “Tokyo Contemporary Art Fair”. Takashi Murakami’s “Geisai” was held again at Big Sight (Katrina Grigg-Saito covered it in a photo-report), though the usual second one of the year almost didn’t happen and in the end was tucked away in a Kaikai Kiki venue in the outlying provinces. “Design Festa”, however, seems to be going strong. Mizuma opened a new branch at Ichigaya, as we reported here. They are to keep one of the floors of their characterful Nakameguro building until it is knocked down in two years. Yuka Contemporary appeared in the Waseda district and Zen Foto opened as a Chinese contemporary photography space, run by the friendly Englishman Mark Pearson (interviewed here on TABlog). Gallery Alpham’s appearance has done much to cement the Bakurocho area as the new Tokyo art town (other galleries in the area include Taro Nasu, Radi-um and CASHI). We took a walk around the district. New space Vacant in Harajuku immediately established itself as a great and fun space for a wide range of events, hosting the come-back of Chim Pom and the Zine’s Mate book fair among their first months’ events. 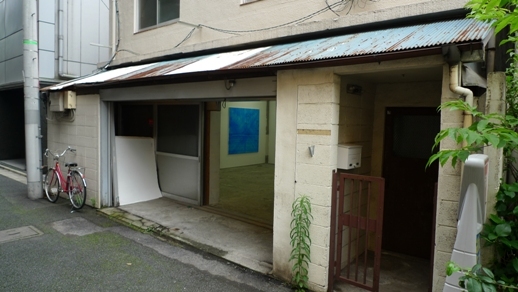 Finally, Ohshima Fine Arts moved into Kagurazaka. The media seemed to be hit the hardest by the recession. Ping Mag stopped publishing on this day last year, and Art Cross followed soon after, despite a re-launch. ArtiT changed from a print magazine to an expanded online one, which is a step back or a step forward, depending on your outlook. TKG Daikanyama closed quietly, as we reported here. Gotanda Sonic also suddenly announced they were shutting down, though rumours say they are re-opening somewhere else. We had a feature on TABlog in June summarizing some of the recession traits in the Tokyo art scene. This year saw, for various reaons, few exhibitions or artistic contributions from galleries Min Min, Nakaochiai and Aoyama/Meguro. Let’s hope we see more of them in 2010. Talking of Shirokane, Nanzuka Underground moved into the gallery building there, making opening receptions much more fun. Zenshi moved out from Kiyosumi to Iwamotocho (which is just about in the burgeoning Bakurocho area), to be joined by Yuka Sasahara next month (moving from Kagurazaka). The most cynical moment of the year? So many to choose from but perhaps Yayoi Kusama’s numerous corporate collaborations, including Iida and Audi. Oh, dear. Nanzuka Underground is going to re-open its old gallery in Shibuya as a second space (which should make openings at Zen Foto livelier) and beloved Megumi Ogita Gallery is moving in January to another (hopefully larger) space in Ginza.